This freeware from ManageEngine ADManager Plus lists all the Domain Controllers and their corresponding roles in the Domain. It also assists the administrator in identifying any associated role of a Domain Controller. Why should you consider this tool? It comes packaged along with several useful Active Directory utilities. Easy identification of Domain Controller Roles helps in making best use of those Servers. Simple, easy-to-use, fast and the best part: this comes to you at ZERO cost. 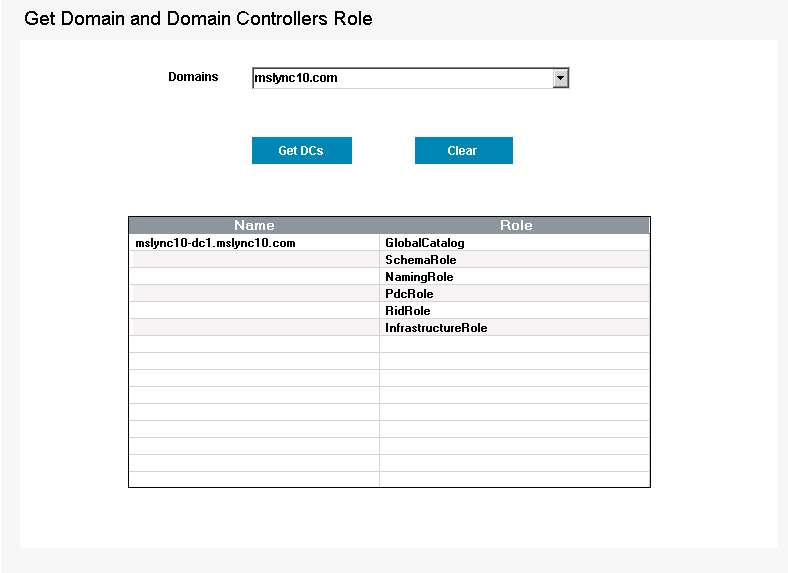 Click on 'Get DCs' button to get the list of Roles available for various Domain Controllers in the selected Domain. You can also run the cmdlet in Powershell by executing the below commands. 'add-PSSnapin GetDomains' followed by 'Get-Domains'.